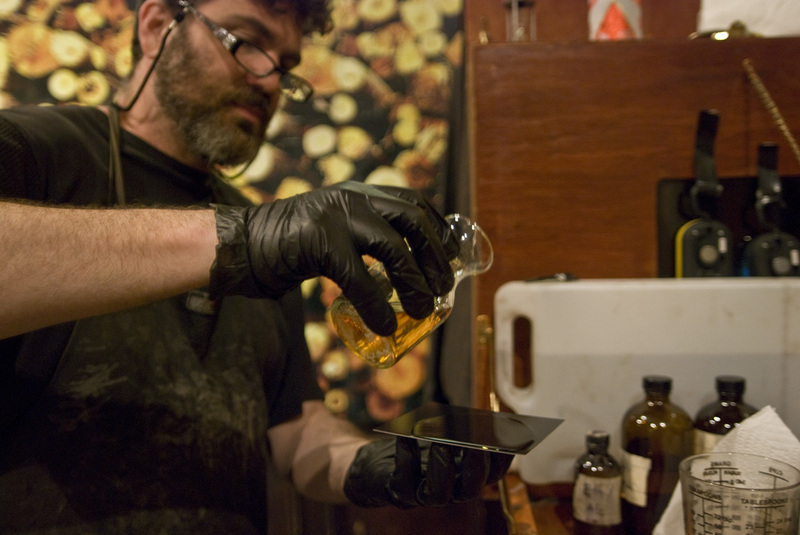 "Tintype" is the common name for the process we use in photographing our subjects. A variation of the Wet Collodion process, tintypes were shot by the hundreds of millions in the years of its heyday, 1855-1880. Tintypes are hand-made photographs. Each one is a one-of-a-kind image, a unique expression of vision and skill. A tintype starts as a black metal plate (iron or steel in the past, aluminum today) which is treated with a series of chemicals that result in a light-sensitive layer coating one side. Just like the practitioners of past generations, a portable darkroom must be set up near the camera, to prepare each plate. The plate is then placed in a special holder so it can be removed from the darkroom. The holder slips into the back of the camera, after it has been set up and focused. A protective slide pulls out of the holder, the lens cap comes off the camera, and BAM! Our powerful strobe light goes off. The slide slips back into place, and the holder is taken back to the darkroom for processing. Bryan showing off the Barbatype Wonder-Camera. It's an Ansco-View 5x7 from the 1920's. The big red lens is re-purposed from a slide projector. We are resourceful and thrifty people here, in Project Barbatype. When the plate comes out of the darkroom, it looks like a white, cloudy negative. It slips into the last chemical of the process, and magically transforms into a beautiful, crisp photograph of unsurpassed clarity. This is always a thrill to watch, and we never tire of it.